Coal is a naturally occurring combustible material consisting primarily of the element carbon. It also contains low percentages of solid, liquid, and gaseous hydrocarbons and/or other materials, such as compounds of nitrogen and sulfur. Coal is usually classified into subgroups known as anthracite, bituminous, lignite, and peat. The physical, chemical, and other properties of coal vary considerably from sample to sample. Coal is often referred to as a fossil fuel. That name comes from the way in which coal was originally formed. When plants and animals die, they normally decay and are converted to carbon dioxide, water, and other products that disappear into the environment. Other than a few bones, little remains of the dead organism. At some periods in Earth's history, however, conditions existed that made other forms of decay possible. The bodies of dead plants and animals underwent only partial decay. The products remaining from this partial decay are coal, oil, and natural gas—the so-called fossil fuels. Anthracite: Hard coal; a form of coal with high heat content and a high concentration of pure carbon. Bituminous: Soft coal; a form of coal with less heat content and pure carbon content than anthracite, but more than lignite. British thermal unit (Btu): A unit for measuring heat content in the British measuring system. Coke: A synthetic fuel formed by the heating of soft coal in the absence of air. Combustion: The process of burning; a form of oxidation (reacting with oxygen) that occurs so rapidly that noticeable heat and light are produced. Gasification: Any process by which solid coal is converted to a gaseous fuel. Lignite: Brown coal; a form of coal with less heat content and pure carbon content than either anthracite or bituminous coal. Liquefaction: Any process by which solid coal is converted to a liquid fuel. Oxide: An inorganic compound whose only negative part is the element oxygen. Peat: A primitive form of coal with less heat content and pure carbon content than any form of coal. Strip mining: A method for removing coal from seams located near Earth's surface. To imagine how such changes may have occurred, consider the following possibility. A plant dies in a swampy area and is quickly covered with water, silt, sand, and other sediments. These materials prevent the plant debris from reacting with oxygen in the air and decomposing to carbon dioxide and water—a process that would occur under normal circumstances. Instead, anaerobic (pronounced an-nuh-ROBE-ik) bacteria (bacteria that do not require oxygen to live) attack the plant debris and convert it to simpler forms: primarily pure carbon and simple compounds of carbon and hydrogen (hydrocarbons). The initial stage of the decay of a dead plant is a soft, woody material known as peat. In some parts of the world, peat is still collected from boggy areas and used as a fuel. It is not a good fuel, however, as it burns poorly and produces a great deal of smoke. If peat is allowed to remain in the ground for long periods of time, it eventually becomes compacted. Layers of sediment, known as over-burden, collect above it. The additional pressure and heat of the overburden gradually converts peat into another form of coal known as lignite or brown coal. Continued compaction by overburden then converts lignite into bituminous (or soft) coal and finally, into anthracite (or hard) coal. Coal has been formed at many times in the past, but most abundantly during the Carboniferous Age (about 300 million years ago) and again during the Upper Cretaceous Age (about 100 million years ago). 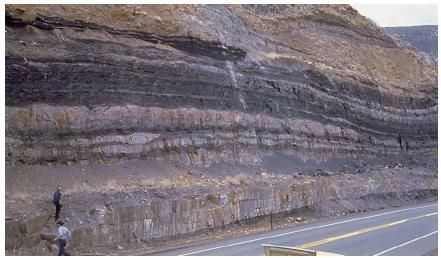 Today, coal formed by these processes is often found layered between other layers of sedimentary rock. Sedimentary rock is formed when sand, silt, clay, and similar materials are packed together under heavy pressure. In some cases, the coal layers may lie at or very near Earth's surface. In other cases, they may be buried thousands of feet underground. Coal seams usually range from no more than 3 to 200 feet (1 to 60 meters) in thickness. The location and configuration of a coal seam determines the method by which the coal will be mined. Coal is classified according to its heating value and according to the percentage of carbon it contains. For example, anthracite contains the highest proportion of pure carbon (about 86 to 98 percent) and has the highest heat value (13,500 to 15,600 Btu/lb; British thermal units per pound) of all forms of coal. Bituminous coal generally has lower concentrations of pure carbon (from 46 to 86 percent) and lower heat values (8,300 to 15,600 Btu/lb). Bituminous coals are often subdivided on the basis of their heat value, being classified as low, medium, and high volatile bituminous and subbituminous. Lignite, the poorest of the true coals in terms of heat value (5,500 to 8,300 Btu/lb), generally contains about 46 to 60 percent pure carbon. All forms of coal also contain other elements present in living organisms, such as sulfur and nitrogen, that are very low in absolute numbers but that have important environmental consequences when coals are used as fuels. By far the most important property of coal is that it burns. When the pure carbon and hydrocarbons found in coal burn completely, only two products are formed, carbon dioxide and water. During this chemical reaction, a relatively large amount of heat energy is released. For this reason, coal has long been used by humans as a source of energy for heating homes and other buildings, running ships and trains, and in many industrial processes. Environmental problems associated with burning coal. The complete combustion of carbon and hydrocarbons described above rarely occurs in nature. If the temperature is not high enough or sufficient oxygen is not provided to the fuel, combustion of these materials is usually incomplete. During the incomplete combustion of carbon and hydrocarbons, other products besides carbon dioxide and water are formed. These products include carbon monoxide, hydrogen, and other forms of pure carbon, such as soot. In addition to these compounds, coal often contains a small percentage of mineral matter: quartz, calcite, or perhaps clay minerals. These components do not burn readily and so become part of the ash formed during combustion. This ash then either escapes into the atmosphere or is left in the combustion vessel and must be discarded. Sometimes coal ash also contains significant amounts of lead, barium, arsenic, or other elements. Whether airborne or in bulk, coal ash can therefore be a serious environmental hazard. Coal is extracted from Earth using one of two major methods: sub-surface or surface (strip) mining. Subsurface mining is used when seams of coal are located at significant depths below Earth's surface. The first step in subsurface mining is to dig vertical tunnels into the earth until the coal seam is reached. Horizontal tunnels are then constructed off the vertical tunnel. In many cases, the preferred way of mining coal by this method is called room-and-pillar mining. In room-and-pillar mining, vertical columns of coal (the pillars) are left in place as the coal around them is removed. The pillars hold up the ceiling of the seam, preventing it from collapsing on miners working around them. After the mine has been abandoned, however, those pillars may collapse, bringing down the ceiling of the seam and causing the collapse of land above the old mine. original state can be a long and expensive procedure. In addition, any water that comes in contact with the exposed coal or overburden may become polluted and require treatment. Coal is regarded as a nonrenewable resource, meaning it is not replaced easily or readily. Once a nonrenewable resource has been used up, it is gone for a very long time into the future, if not forever. Coal fits that description, since it was formed many millions of years ago but is not being formed in significant amounts any longer. Therefore, the amount of coal that now exists below Earth's surface is, for all practical purposes, all the coal available for the foreseeable future. When this supply of coal is used up, humans will find it necessary to find some other substitute to meet their energy needs. Large supplies of coal are known to exist (proven reserves) or thought to be available (estimated resources) in North America, Russia and other parts of the former Soviet Union, and parts of Asia, especially China and India. China produces the largest amount of coal each year, about 22 percent of the world's total, with the United States (19 percent), the former members of the Soviet Union (16 percent), Germany (10 percent), and Poland (5 percent) following. China is also thought to have the world's largest estimated resources of coal, as much as 46 percent of all that exists. In the United States, the largest coal-producing states are Montana, North Dakota, Wyoming, Alaska, Illinois, and Colorado. For many centuries, coal was burned in small stoves to produce heat in homes and factories. As the use of natural gas became widespread in the latter part of the twentieth century, coal oil and coal gas quickly became unpopular since they were somewhat smoky and foul smelling. Today, the most important use of coal, both directly and indirectly, is still as a fuel, but the largest single consumer of coal for this purpose is the electrical power industry. The combustion of coal in power-generating plants is used to make steam, which, in turn, operates turbines and generators. For a period of more than 40 years beginning in 1940, the amount of coal used in the United States for this purpose doubled in every decade. Although coal is no longer widely used to heat homes and buildings, it is still used in industries such as paper production, cement and ceramic manufacture, iron and steel production, and chemical manufacture for heating and for steam generation. Another use for coal is in the manufacture of coke. Coke is nearly pure carbon produced when soft coal is heated in the absence of air. In most cases, 1 ton of coal will produce 0.7 ton of coke in this process. Coke is valuable in industry because it has a heat value higher than any form of natural coal. It is widely used in steelmaking and in certain chemical processes. A number of processes have been developed by which solid coal can be converted to a liquid or gaseous form for use as a fuel. Conversion has a number of advantages. In a liquid or gaseous form, the fuel may be easier to transport. Also, the conversion process removes a number of impurities from the original coal (such as sulfur) that have environmental disadvantages. One of these conversion methods is known as gasification. In gasification, crushed coal is forced to react with steam and either air or pure oxygen. The coal is converted into a complex mixture of gaseous hydrocarbons with heat values ranging from 100 Btu to 1000 Btu. One day it may be possible to construct gasification systems within a coal mine, making it much easier to remove the coal (in a gaseous form) from its original seam. In the process of liquefaction, solid coal is converted to a petroleum-like liquid that can be used as a fuel for motor vehicles and other applications. On the one hand, both liquefaction and gasification are attractive technologies in the United States because of its very large coal resources. On the other hand, the wide availability of raw coal means that expensive new technologies have been unable to compete economically with the natural product. How do you account for the petrified trees found passing through different layers of coal seams?